Frederik van Oudenhoven first travelled to the Pamirs in 2007 to document what remained of that rich agricultural biodiversity. What he found was bewildering, until he began to talk to Pamiri people, and especially the older women, about their food and culture. The result is With Our Own Hands: a celebration of food and life in the Pamir Mountains of Tajikistan and Afghanistan, a new book by van Oudenhoven and his co-author Jamila Haider, that documents a culture that remains in danger of disappearing. With Our Own Hands is published by LM Publishers, who say it will be available from tomorrow, 7 July. If you think you might want a copy, order without delay; until tomorrow the price is reduced to €34.50 from €54.50. You can get a taste here. There are also a couple of scholarly articles online. Imagining alternative futures through the lens of food in the Afghan and Tajik Pamir mountains and Food as a method in development practice. Photos by Frederik van Oudenhoven. The banner shows an Afghan settlement in Darvaz, along the Panj River, in autumn, with yellow mulberrry trees and red apricots. 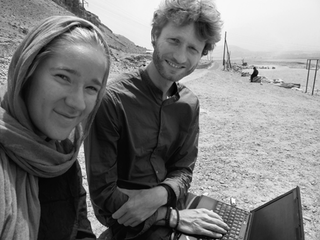 the other picture is Frederik and his co-author Jamila Haider.